The New York Public Library’s Lionel Pincus Map Library has an amazing tool, The NYPL Map Warper, which allows and encourages the public to help geo-rectify their collection of historical maps. Over 2200 maps have been rectified to date. 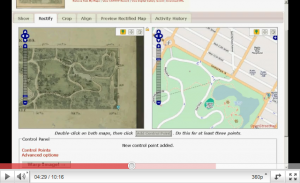 The tool is a customized version of an open source map warping/rectifying tool (MapWarper) created by Tim Waters and MIT licensed, so available to developers. On the Mapwarper site, you can upload your own scanned maps and use the tool to rectify and export! The base map is Open Source, but after exporting, a map could be layered onto Google Maps or anything else.